I believe in something I call the validity of the retrograde perspective. It states that there is a second, opposite way to view any action. For instance, we think we walk forward, but perhaps our energy really pulls space a little while we stay still. This opposite view may seem utterly counter-intuitive and ridiculous, but in some instances it was the prevailing view of our civilization. For a very long time no one thought the Earth was moving — we can’t feel its motion, even though it accelerates at certain points in its orbit. I am told there is no reason why we ought to feel the Earth move, but I think it speaks to the validity of both perspectives, that the Earth is moving, and that the Earth is pulling space. past my brain as the present time. I believe in contradiction. I believe that the Everything and the Nothing exist simultaneously, and that their particular intersection according to my perspective creates the illusion of Something. I believe that we are all one, and all separate, simultaneously. and the distant trees were really that small? There is a moral consequence. It has to do with good and the absence of good, which one might call evil. For goodness has long been equated with selflessness, and the one who gives up everything she has is good, even though a society made up of such good people who have all given up all their belongings makes no sense. No, I believe that true morality is when selfishness and selflessness exist simultaneously. Only when one is allowed to be selfish is one freed to be selfless. I don’t mean that one ought to take care of themselves first. I don’t mean that one ought to be selfish in one moment and selfless the next. But truly simultaneously selfish and selfless. I read a few philosophy papers about the nature of doing a good act (helping someone whose car had broken down, for instance). There is a whole philosophical argument about whether we can know that someone is acting selflessly or not, since doing a good act will bring her some joy and that is a selfish thing. The fact that we cannot even separate selflessness from selfishness tells me that popular ideas of what is good are wrong. And we know they are wrong. If we really thought in our hearts that giving up all we have is good, and that not caring for ourselves is good, and that utterly obliterating our ego is good, it would be instinctual to do so. We would want to do it so deeply we would not have to struggle. If we really thought we were all one, we would be nearly incapable of denying someone else joy. Our private inner world gives us overpowering evidence that selfishness is important, and that we are as separate as we are one. So I believe we should be, simultaneously, as fabulous as queens and as humble as servants. May I be the servant-queen. It has been some time now that I have felt distanced from shamanism. I am thinking and writing for myself a great deal, but it is hard to write for others just now, since everything seems undefined like shadows within shadow. I am wary of any claim or commitment. Yet I have made progress in discovering my own path — or, rather, in cutting this path myself from an untamed prehistoric jungle. It occurred to me that someone might appreciate these vague notes of my process, because it seems like a lot of people are setting out on similar new beginnings. I think for some people, myself included, the path is a perpetual fresh start. I have tried many belief systems, searching for something outside myself to place atop my own core values. Over time I have shaken them all from my crown like leaves to cover the ground and rot — yet continue to nourish me in some way. For my core beliefs move slowly, deep-rooted, patient, unconcerned. Their needs are simply met. I try to listen to their wisdom, but they don’t sing so much as hum — and more often than not, I find the hum is merely the work of sucking up life from the Earth or drawing down life from the Sun. Still, there is Truth in it that cannot be easily explained or identified, and I honour it. I’ve taken to wearing a headcovering from first thing in the morning until bedtime. I don’t have the words for the reasons. There is a rightness and a beauty to it, but I accept it is a temporary and even arbitrary thing. Everything is infinitely meaningful and infinitely meaningless. The Everything and the Nothing exist simultaneously and I do my best to take it all in. 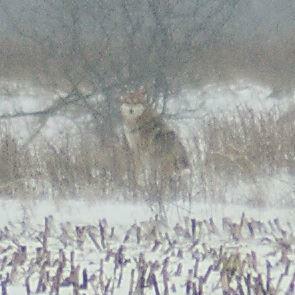 This past weekend my wife and I came across what was likely a coyote, if not a wolf, running across a field. We managed to get a photo from afar, and it looks enough like a dog that we called our local humane society to report it. But I know it was wild. The following day we rose at 4:30am and drove out to look for it again, catching sight of deer along the way. 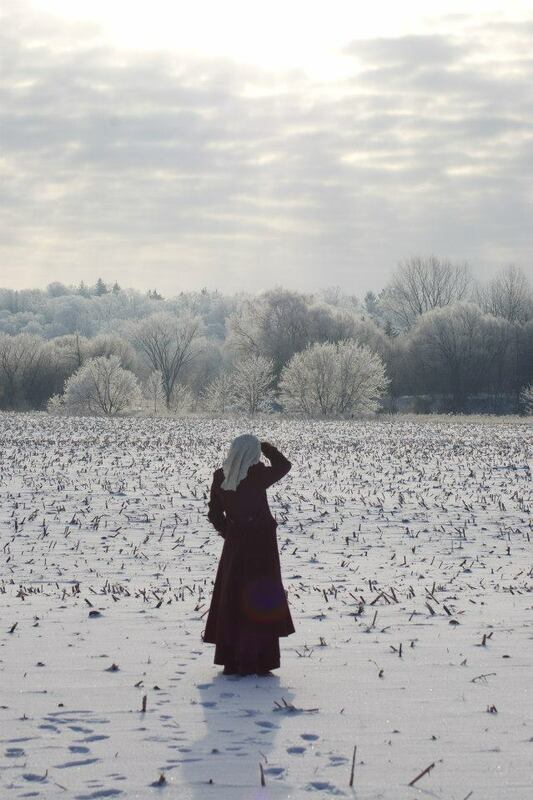 The trees were all thickly dusted with crystalline frost, looking far beyond ordinary. We came to the field by the Grand River where the coyote had been and found a handful of track lines in the snow, some tantalizingly fresh. I followed them half-way across the field, in excruciating pain from the chill on my bare hands, yet was captivated and sorely tempted to follow them right into the bush. They drew me along with all the suspense of a story but in a language I was ill-equipped to understand. Then I saw one line of tracks abruptly branch out into two — one animal had been following almost exactly in the pawprints of another! This meant there were at least a pair of animals roaming the field, and for me that proved what we saw was not a lost dog. It calls me as if blood-to-blood; I am listening.